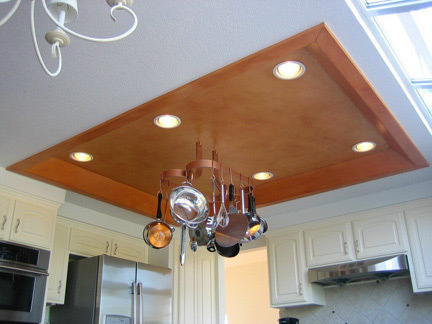 This kitchen tray ceiling seems made for a treatment that would enhance it as an architectural detail, add warmth, depth and interest, and reflect the copper accents throughout the room. The Clients, accomplished cooks, appreciate the appetite-stimulating effect of the coppery orange colors! WIndsor, Ca. To see another ceiling treatment, click link below.